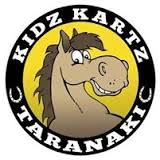 Kidz Kartz in the Waikato was established to give kids aged 6 years to 16 years a positive introductory experience into harness racing using ponies. It fosters fun for both kids and ponies. Also helping to develop a well rounded individual who is capable to driving safely, tactfully and has knowledge to care for a horse or pony. This pathway is proving a success when members chose move through to the Junior Driver ranks in Harness Racing or the racing industry as a whole. Kidz Kartz was first established in New Zealand in 2003 by Dennecce Goldsworthy at Kumeu. A few years after this the sport had grown popular enough in the Waikato region to support its own club. Waikato Kidz Kartz and Pony Trust was established in November 2004. The first dedicated bunch was Susan Branch, the first Club President, and now Life Member. Wendy Ferguson, Marlene Dickie and Sheryll Tafft who is now honoured in the annual Sheryll Tafft Memorial. Our Club Patron is Sandy Yarndley. The kidz kartz sport has now become a very popular way for young people to experience involvement in harness racing with clubs throughout New Zealand at Kumeu, Pukekohe, Christchurch, Southland, Otago and newly established Taranaki. Many thanks to Phil Williams at Fokus Harness Racing Photography for supplying many of the awesome photos on this site.